All photos by Panagiotis Macromanolis and Eija Arjatsalo. Copyright 2017. If you want to use a photo on another website, please email or PM me for permission. It is also possible to download any or all the photos. We will also make a Gallery with meetup photos but it will take a while. 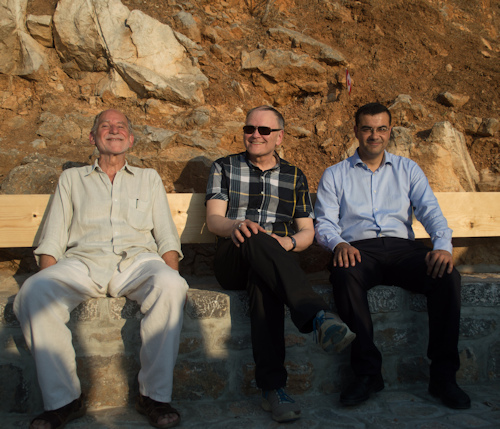 From the right: Mr. George Koukoudakis, Mayor of Hydra, Jarkko, Mr. Lakis Christidis of Hydra Cinema Club. Tell me is night coming on so calm up there? And are the crickets there singing and the vesper bells ringing? Is your mother standing in luminous air? You crossed over you were going home. Tell me what Marianne looks like in heaven. Her hair upon the clouds like a sleepy golden storm. Is Nancy still talking so freely up there? She knows from your eyes that tonight will be fine. Do you sit with Hank Williams in the tower of song ? Talking how lonely it gets up there. You will always be the teacher of my heart. Your golden voice in my ears forevermore..
You got me singing even though your world is gone. And I miss you so much, there is no one in sight. Forgive me for taking your words for this song. As you know a lover needs to be a thief sometimes too.